It’s easy to believe the best way to reach your customer base is through strategic, targeted online ads using Google, Facebook, or other forms of social media. Tactical marketing strategies which implement the immense power of data to reach the right customer is undeniably an innovation within the world of ads. But social media marketing is not always the best or most effective marketing strategy to win over your customer base. In fact, the pervasive nature of targeted online ads may end up reducing its effectiveness with regards to conversion rates. Often, if you’re seeking to make a serious impact within a person’s limited attention span, you need to utilize a marketing strategy that incorporates a unique appearance into its presentation, one far outside of the norm when it comes to traditional advertising. It’s no secret that social media can offer firms an unprecedented amount of information about their customers, allowing companies to specifically target a highly specialized section of the marketplace. This intense amount of user data can be invaluable to companies seeking to directly reach their customer base while also having an increased level of tracking and monitoring of a particular marketing campaign. While there are undeniable benefits to this level of real-time data and interaction with your customer, it can also include a handful of downsides which can make social media marketing less-than-ideal. If you are advertising on Facebook, Twitter, or another form of social media, you may deal with an increased level of scrutiny as well as real-time customer complaints, feedback which is visible to the eyes of the public. It’s not just a matter of creating a Facebook page and guiding the conversation regarding your business or product; it also requires customer service expertise and a high level of proficiency in communication. If you think you’ll just be able to post without having to interact with potentially unruly customers, you’re in for a rude awakening as you could be spending large amounts of time managing your page’s presence. Guerrilla marketing offers an innovative and effective approach to companies and individuals seeking to break through the attention barrier and get their ad noticed. It provides an unmatched resource for reaching a hyper localized customer base and does so with ease. It’s hard to ignore an unusual, large sign when it’s driving right in front of you or moving down a sidewalk with an enthusiastic sign troop manning their post. The battle to get noticed requires companies to change their approach and create marketing campaigns which evolve past tired, stale strategies towards ones which truly make an impact upon the intended target market. Guerrilla marketing can offer inventive and original approaches to shatter monotonous, ineffective marketing tactics. It can allow you to reach potentially thousands of customers in a short period of time, maximizing your cost without requiring you to be an expert in digital marketing. If you’re running your own business, time is a precious resource you can’t afford to waste, and can often make the act of social media marketing a burden not worth dealing with. If you’re seeking a swift marketing solution which offers instant results for your business, contact Denver GS today. 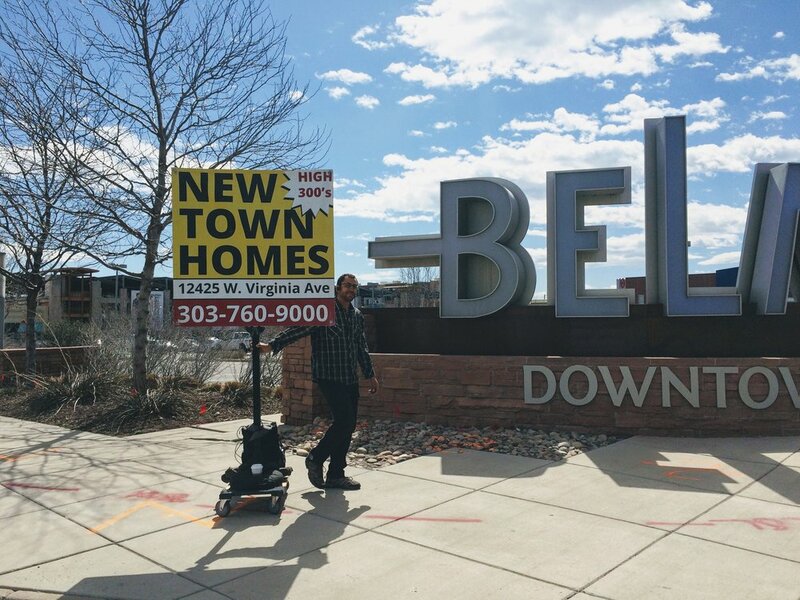 Our Guerrilla Signs hardware is being used nationally to help nonprofits, real estate firms, QSRs, and for many other industrious marketing solutions.